I have a laptop with the OS Windows XP SP3. I use a Pentax K-7 which I can set to RAW of PEF or DNG plus JPEG. I view (and delete) files on the laptop but will not edit until I purchase a new computer with WIN7. I do not understand whether I am to purchase FastPictureViewer Pro or the Codecs, or both. Joke aside, the Codec Pack is a Windows operating system -level add-in that enables Windows to read many new image formats (44 file extensions at last count). Windows Explorer gets the ability to create thumbnails from images formats it does not normally understand and, on Windows Vista and Windows 7, the built-in image viewers (Windows Photo Gallery and Windows Photo Viewer, respectively) also get the ability to open new image formats, as well as Windows Media Center on Windows 7 and several 3rd-party applications. All details are on the Codec Pack web page. FastPictureViewer Professional, on the other hand, is a stand-alone image viewer specifically created for fast image culling and rating. FastPictureViewer Professional supports the same raw formats as those enabled by the Codec Pack (same camera models etc), while the Codec Pack adds about 10 extra formats on its own, including Photoshop PSD, as well as a special JPEG codec that works on Vista and Window 7 and performs EXIF-based automatic rotation of JPEG images. Depending on your needs, you may want to install one or the other, or both. The two products are designed to work well together and complement each other nicely and FPV Pro gets access to more images formats with the Codec Pack installed. I thank you for your response, Axel. 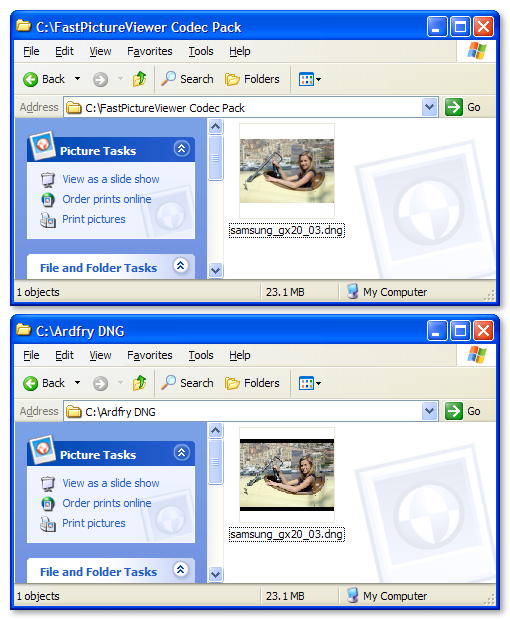 The Codecs Pack allows Windows Explorer to operate as would FastPictureViewer, albeit with the availability of more image formats. In other words, the Codecs Pack eliminates the need to use FastPictureViewer, especially when using Vista or Win7. FastPictureViewer, though, would eliminate the need to use Windows Explorer to view images. In my case, I would rather not rely on a Windows program (Windows Explorer) to view my images. Since I really only care about Pentax PEF, DNG, and JPEG images, would I be correct in the belief that FastPictureViewer would be more than capable of allowing me to view my images? Hum, "eliminate" is a strong word. Actually, FastPictureViewer Professional is a completely different viewer than Windows Photo Viewer, with a very different feature set. If one defines "image viewing" as displaying a file in a window and providing forward/backward navigation then yes, Windows Photo Viewer (with the Codec Pack installed) can do that just as well as FastPictureViewer Pro, and it't true that the Codec Pack supports more formats. FPV Pro should "win" speed-wise as it preloads more images when resources allow, but for very simple viewing Windows Photo Viewer will do just fine. On the other hand, if you need to check histograms, EXIF data, view images in full-screen, rate image quickly, tether your camera or manage files in batch then FastPictureViewer Professional has a lot to offer that Windows Photo Viewer does not... see the Getting Started guide to get an idea!